Winsnap is a really fabulous piece of share ware that has saved me many hours of fiddling around creating images for web site. 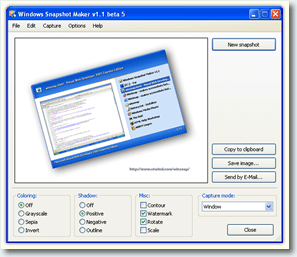 To quote their website: “WinSnap is a small enhancement utility for taking and editing screenshots. It can easily capture windows of non-rectangular form with the background of your choice, automatically perform simple canvas transformations and coloring effects, add professional smoothing shadows in Photoshop style and more. What it means for me is that I can capture rounded-edge windows, areas and drop down menus and automatically add a shadow on an appropriate background saving me many hours of trying to get Photoshop under control. I don’t know how I’ve managed for the last ten years without it! This entry was posted on Monday, January 8th, 2007 at 11:16 am and is filed under All, Making Life Easier. You can follow any responses to this entry through the RSS 2.0 feed. You can leave a response, or trackback from your own site.